After studying law and 15 years as a lawyer in international companies, she decided to comeback to her first passion, drawing and painting . In 2001, she discovered the delicate botanical watercolour with Nicole Gawsewitch then others technics as pastel,acrylic and oil. Since her childhood in the french country, she lives with the love of nature,gardens and animals, her main subject today. From her travels all around the world, she brings back watercolour and sketches travel books,which represent her canvases bases realized in her workshop. 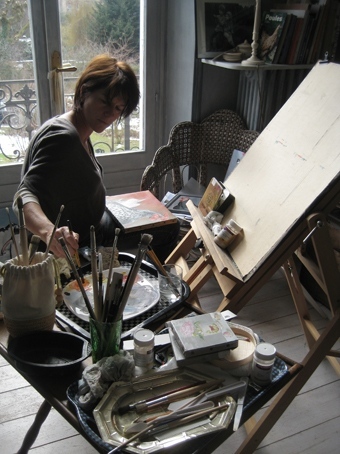 She creates scenery for the association " Les baladins de la Vallée" . She is carrying on with her formation in Paris with Shaune Neill, Camondo school and ateliers des Arts décoratifs teacher.